Ami Horowitz, the producer and director of the movie UN Me, was motivated by the way Michael Moore interwove humor into his 2002 “documentary” Bowling for Columbine to do something similar with the United Nations. “Say what you will about Michael Moore, the guy knows how to make an entertaining and powerful film,” Horowitz told The Daily Caller. We are dealing with very difficult issues ultimately—very heavy stuff—and to do it without levity, I thought, would be a recipe for disaster. Nobody wants to sit there for 90 minutes…watching terrible images cross the screen, so I knew humor had to be a part of it. In his film, Horowitz does an expert job presenting the “very heavy stuff” exposing the corruption of the widely revered UN institution—so expert in fact that his exposure swamps the levity. But it is the information and not the humor that’s important, and Horowitz cannot be blamed for the fact that his information is shocking not humorous. What he has wrought is one of the most terrifyingly horrific presentations of the truth about the United Nations ever captured on celluloid. The Cote d’Ivoire incident where UN peacekeeping troops fired on innocent civilians. The Oil for Food scam where Saddam Hussein’s oil vouchers that were supposed be used to feed his people were instead used to build his personal wealth and buy influence from top officials around the world, including the United Nations. The genocides in Rwanda and Darfur, which were aided and abetted by top people in the UN. What I would recommend for this organization [is] to give it one last try—I would say…to create some kind of accountability and transparency. I think you have to immediately reform the Human Rights Council…and toss out a couple of bad actors. 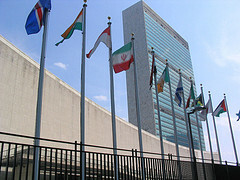 Ending all participation by the United States in any and all conventions and other agreements that may exist with the UN. For its opening weekend, UN Me is showing in New York, Los Angeles, Chicago, Dallas, Washington, D.C., Houston, Phoenix, Denver, San Diego, West Palm, and Colorado Springs. It is also available nationwide via Video on Demand (VOD) from major cable networks. This reviewer urges everyone to see the movie—though when you do so, don’t expect to be entertained. Instead, hopefully you will be motivated to go beyond the film’s suggestion for “reform” (it would no more sense to try to “reform” the UN than it would to “reform” cancer) and instead help to Get US out! To learn more about UN Me, go to the movie’s official website and/or watch the official trailer below. To see the The John Birch Society’s review, which includes links to other materials exposing the UN, click here. This entry was posted	on Monday, June 4th, 2012 at 2:29 pm	and is filed under Foreign Policy, Reviews. You can follow any responses to this entry through the RSS 2.0 feed. You can leave a response, or trackback from your own site.